I try not to every say something is my absolute favorite or the cutest or the best idea that I have ever seen. There are WAY too many great ideas out there that I have seen to make that claim and I know that there are a thousand times as many great ideas that I haven't seen. 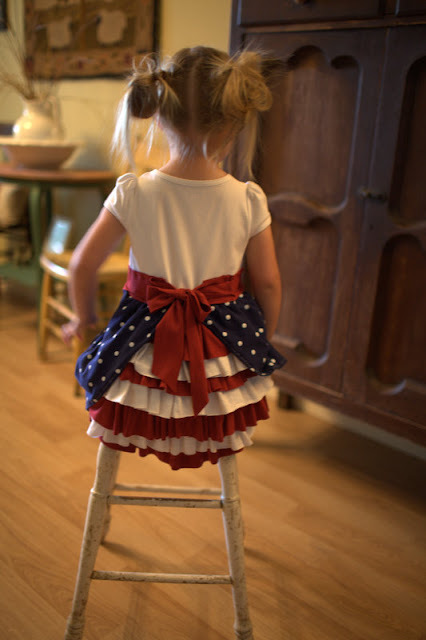 But it is really hard not to say that this is the cutest 4th of July dress I have ever seen. It is also hard for me to believe that Holly doesn't consider herself a seamstress. I hope she starts considering herself one now. You can check out the tutorial for this fabulous bustle dress over at Heart Break Kids. Awwww...this is adorable! What little girl wouldn't just LOVE a ruffled, twirly dress that is COMFORTABLE!! definitely one of the cutest dresses i've ever seen!!! this is just so darned pretty. Really fantastic job! This is a VERY cute fourth of July dress! Love it! SOOOOOO CUTE! I may have to attempt it myself. Before I even read it I said ":Oh my goodmess! That is the cutest thing I have ever seen" and my lttle girl walked over to see what i was talking about and she sad you ARE going to make that for me arent you? Definetly the cutest 4th f july dress I'VE ever seen!